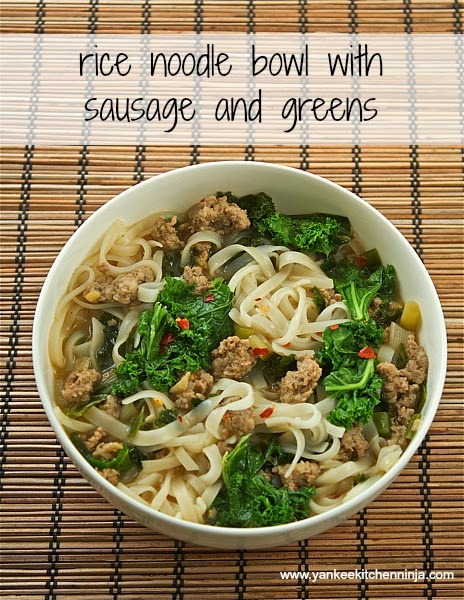 Easy rice noodle bowl with sausage and greens -- a quick and hearty weeknight meal plus leftovers for your lunch bag. Tomorrow is the last day of Detox January: how did you do? I lost my annual five pounds and am feeling much fitter. And I'm happy to be back to eating better, too (my butter consumption is a fraction of what it was over the holidays). Lest you think that on Saturday we will start celebrating Retox February, I'm sharing this easy, hearty rice noodle bowl so you can keep your Detox January healthy habits going. Part soup, part pasta dish, this rice noodle bowl is just the ticket for winter dinners. And, given how easy it is to prepare, it's a perfect weeknight dish that will leave you with leftovers for your lunch bag, too. Two meals in one? Score. This rice noodle bowl is also versatile and customizable. I have been making it lately with kale or collards, but it's also deliciously spicy with mustard or turnip greens. If you prefer a less sharp green, substitute some swiss chard or bok choy. Also, I use hot Italian sausage because I like the spicy kick. For less heat, try mild Italian sausage or even plain ground pork, mixed with a little garlic and cumin. Whatever meat you use, however, don't skip mixing the grated ginger into it or you'll be missing out. I have a hard time finding wide rice noodles in my neck of the woods, so I used the skinnier, fettucine-like noodles. If you have access to the wider ones, I think they'd be even better. 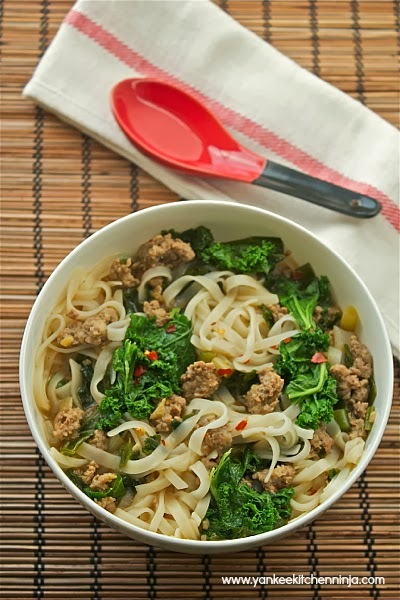 Are you a fan of noodle bowls? Do you have a favorite flavor combination? Leave a comment: The Ninj wants to know. You may substitute mild Italian sausage or ground pork. If using pork, try mixing in some extra cumin and a little garlic for a flavor boost. Also, use whatever greens are your favorite: turnip greens, chard and mustard greens are all great choices. In a bowl, combine the sausage meat, ginger and cumin until blended (using your hands is best here). Heat the oil in a soup pot and add the sausage mixture, stirring to break up the chunks until cooked through (about 10 minutes). Add the chicken broth to the pot and bring mixture to a boil. Reduce heat and simmer for 10 minutes. Next, add the greens, onions, soy sauce and fish sauce and cook until the greens are just tender (about 5 minutes). Remove from heat and season to taste with salt and pepper. While the broth mixture simmers, cook the rice noodles according to package directions. Drain and add the rice noodles to the soup pot, giving everything a good stir before serving. This looks delicious. What would be a good sub for fish sauce? I have sesame oil and/or curry paste, would those work? If you're not allergic to fish sauce, I would *highly* recommend buying a bottle, even for this little bit. You'll be amazed at how it livens up many Asian-style dishes. If you are allergic, you can substitute hoisin sauce or a little miso paste mixed with soy sauce. This is so perfect for all these cold winter nights that we've been having lately! Yum! This reminds me of ramen, and I love ramen! It is very ramen-esque, Chris, so you'll totally dig it! 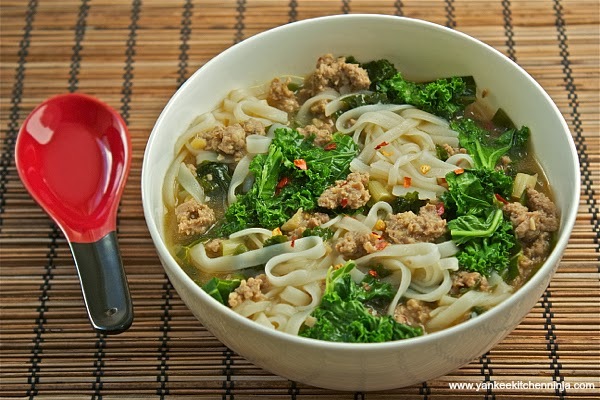 Now that's a nice looking bowl of noodles! I'm doing the after holidays thing too and this looks like a perfect, light, winter meal. Love everything about it! BTW, I would highly recommend a bloggers conference. 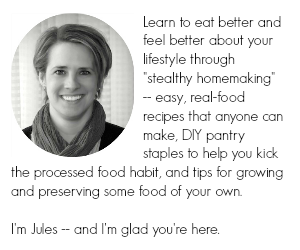 I wrote about the anxiety that I felt but it was an awesome experience and I'll definitely do it again! Loved meeting other bloggers and hearing about their experiences. Thanks, Bill -- I'll have to see if there's a local conference coming my way anytime soon. Wow, this looks delicious! But I must admit that I am sad to see Detox January come to end. Just in time for the Super Bowl, though!! Don't worry, David -- my recipes will continue to be Detox January-adjacent. ;-) And it will be back next year! oooh, i made the BA version too. yours looks delicious... perfect for these cold nights. I made the recipe that was in Bon Appetit, from which you adapted this recipe. It was FANTASTIC! I have put it into my recipe file as a keeper.